Is "J" short for "James" or "John William"? When he started researching the field, Jim Boys included only those men he knew from records had actually arrived in the Crimea and were entitled to the Crimea Medal. He later accepted that this was too restrictive, but was unable to add all the men who embarked for but did not reach the Crimea. Many, for example, died en route at Varna, Bulgaria, where epidemic diseases such as cholera were rife in the camps. Others arrived too late to qualify. Further information: Crider, 3rd edition, p. 119 (listed as "J.W. Vann"); Wendy Leahy, Shadows of Time website (www.shadowsoftime.co.nz/4ths/dragoon.html (listed as "John William"). Height at enlistment: 5' 7"
Another brother, Henry, a sergeant in the RE, died at Mauritius in 1867. John Vann, 50, 1791, Male, Agricultural Labourer. Mary Vann, 45, 1796, Female. Thomas Vann, 20, 1821, Male, Bricklayer Apprentice. Ann Vann, 14, 1827, Female. 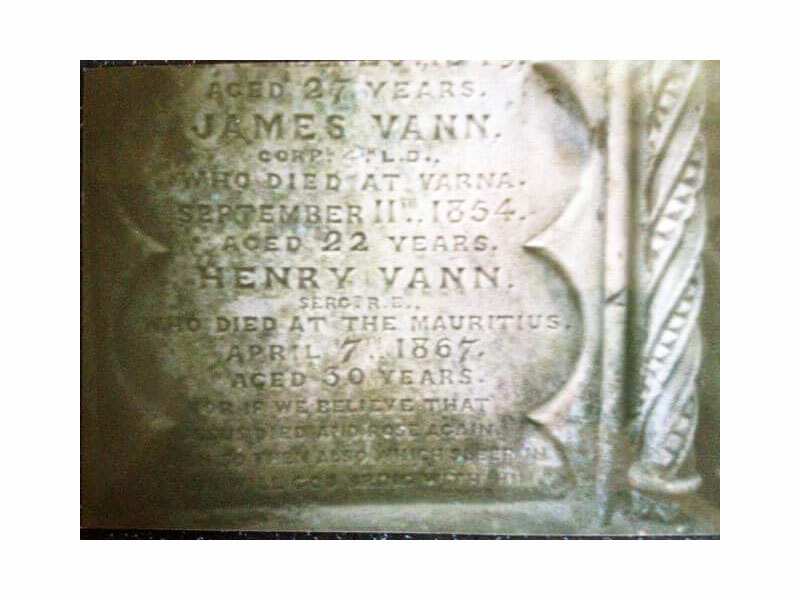 James Vann, 10, 1831, Male. Joseph Vann, 8, 1833, Male. Henry [?] Vann, 5, 1836, Male. King [?] Vann, 3, 1838, Male. In affectionate remembrance of JOHN VANN, who died February 18th 1867 aged 78 years. MARY wife of the above who died October 18th 1853 aged 59 years. also of their sons THOMAS VANN who died September 23rd 1849 aged 27 years. JAMES VANN Corpl 4th L.D who died at Varna September 11th 1854 aged 22 years. HENRY VANN Sergt R.E. who died at the Mauritius, April 7th 1867 aged 30 years. For if we believe that Jesus died and rose again Even so them also which sleep in Jesus will God bring with him.